Finally, Samsung has rolled out official Android 4.1.1 Jelly Bean to Singapore and Malaysian users. This is an official firmware for Galaxy S3 GTi9300, so you can get the update via OTA by go to Settings> About Phone>System Updates >Check for updates. Besides this, you can also update your Galaxy S3 via Samsung Kies application. But, if you have tried both of the methods as above and still cant get the Android 4.1.1 Jelly Bean Update notification, then how? Yes, if your phone has been rooted, then may be you unable to receive the latest firmware notification. Method 1: OTA Update for Rooted Galaxy S3 GT i9300 to Android 4.1.1 I9300XXDLJ1 Jelly Bean. Step 1: Unroot your Galaxy S3. There have several method to unroot your Galaxy S3. Here I have temporary unroot my Galaxy S3 via OTA RootKeeper application. This method to temporary unroot your galaxy S3 is same as what I have shared with you how to unroot Galaxy Note 2. So refer link here to get more info on how to unroot your Galaxy S3. Step 2: On your phone, go to Settings> About Phone>System Updates >Check and download for updates. Method 2: Update for Rooted Galaxy S3 GT i9300 to Android 4.1.1 I9300XXDLJ1 Jelly Bean via Samsung Kies. Step 1: Yes , you need unroot your Galaxy S3. Step 2: Refer tutorial here on how to update firmware via samsung kies application. Method 3 : Update Galaxy S3 GT i9300 official Android 4.1.1 I9300XXDLJ1 Jelly Bean via Odin. Step 2: On your phone, go to Setting>Developers Options to enable USB Debugging. Then power off you phone. Step 3: Press volume down Button + Home Button + Power Button, and you will boot into download Mode warning page. Then press volume up to boot into downloading Mode. Step 3: Open Odin. Then connect your Galaxy S3 to computer via USB cable. Step 4: Odin application will detect your Galaxy S3. If Samsung not detect your Galaxy S3, then make sure that your computer has installed Samsung Kies application and your Kies application is not open when you open then Odin application. Step 6: Click start button to start flash the Android 4.1.1 I9300XXDLJ1 Jelly Bean into your Galaxy S3. You Galaxy S3 will automatically reboot once Android 4.1.1 I9300XXDLJ1 Jelly Bean completely flash into your Galaxy S3. 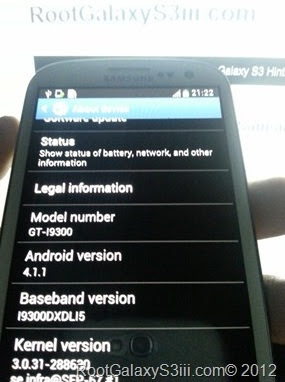 0 Respones to "How To Update Rooted Galaxy S3 To Official Android 4.1.1 Firmware"